Sophia Drew (Chair PDEA) presenting Daniel Graham (Secretary F.O.S.A.C) with the cheque. Friends of the Scala worked very close with Prestatyn and District Environment Association on Friday 20th, with a street collection organised by the PDEA. Its was a great day and £716.56 was collected on behalf of the friends. I would like to thank all the members of both groups and the residents of the local area who came out to help collect, even the rain held off for us it was all in our favor. Through the hard work and effort of everyone involved this will be a nice boost towards funds for the running of the group and our goal of the new Scala development. 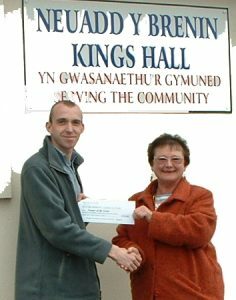 I would also like to thank Sherry Edwards for her hard work and dedication on the day and the days leading up to the event, and the Neuadd y Brenin- Kings Hall managment committee for their kind use of the hall and facilities as a central meeting point for collections and counting.